It’s hard to see your baby dribbling, drooling and chewing on their hands as they try to soothe their sore gums. 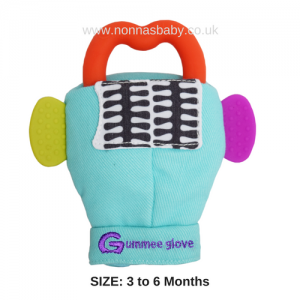 The multi award-winning ‘Gummee Glove’ is designed to help little ones help themselves. The mitten is made to fit babies from 3 to 6 months. It’s perfect for youngsters who are unable to hold a teething toy on their own. No more problems with toys falling on the floor or out of the pushchair. 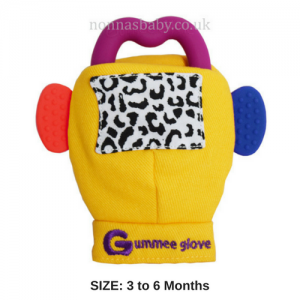 The Glove attaches to baby’s hand with a velcro closure at the wrist. It has colourful, biteable side tabs and a detachable heart-shaped silicone teething ring, that can be heat-sterilised or refrigerated. 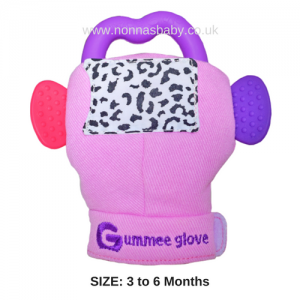 The Gummee Glove is machine-washable in the handy laundry bag that comes with every purchase, this doubles up as a travel bag. The mitten is designed to fit babies from 3 to 6 months. The mitten features a heart-shaped, silicone teething ring, side teethers and a crinkle patch. It can be adjusted to fit a baby’s hand with the velcro closure at the wrist. The mitten itself is made of cotton and is padded for comfort and to absorb a baby’s saliva. Detachable silicone teething ring that can be sterilised and refrigerated. Two silicone teethers attached to the side of the glove. Adjustable velcro closure to fit most babies from 3 to 6 months. Glove can be machine-washed in laundry bag / travel pouch.